In 2017, ENGINEERING.com surveyed 151 product development professionals about how they manage product data. Our analysis focused on the types of systems used, how they were used, and the correlation between system types and common product design failures. The results of this analysis should provide design and development teams information to help them benchmark their results relative to the industry. Approximately half (49%) of all respondents do not have a formal PDM/PLM system. Design teams spend a surprising number of hours each week looking for files and on other non-productive activities. 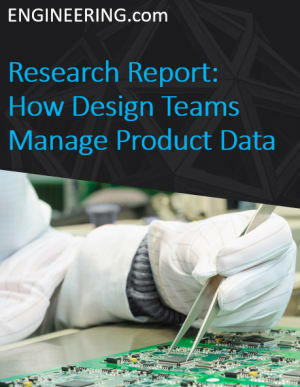 Respondents were generally disappointed with their team’s performance on seven measures of design process control, from sharing data, to ECOs, to avoiding redesigning the same part. The data supporting these findings are presented in charts and graphics in this 25 page report. To access this research report, please fill out the form on your right. This research has been sponsored by SOLIDWORKS.